Don’t stress yourself if you miss the odd period, unless you think you may be pregnant. The hormone balance in the body is very finely tuned and any slight change in normal body function or activity may affect the hormones and disturb the usual reproductive cycle which usually results in an egg being released from the Ovaries once a month. During the month the lining of the womb grows and prepares itself to receive a fertilised egg. If the egg is not fertilised then this lining is shed each month and the whole cycle starts over again. So many factors may affect this cycle on a one off basis, such as, stress, poor nutrition, increased exercise levels, a shock, breast feeding. If periods are persistently irregular then this should be investigated by a doctor to eliminate polycystic ovaries and endometriosis. I have treated both of these conditions very successfully in my clinic but they need careful monitoring so I do not advise self medication. If no underlying cause for irregular periods has been found then it is usually easy to get the cycle back on track with herbal medicine. Very very important as we need the right building blocks in there that make the hormones. An intake of the omega oils, 3, 6, 9 is essential for the production of hormones in the body. These are found in oily fish (salmon, mackerel) seeds and nuts and evening primrose oil. The other essential ingredient for a healthy reproductive system is Zinc, found in pumpkin seeds, peas and oats. Of course all nutrients are essential in sensible amounts but if these are lacking in the diet then the hormone production will be thrown out. For the one and only time I am going to say that excess exercise is not good for you. It raises the testosterone levels in the body and can cause irregular or cessation of periods. By excess I do not mean going for a walk or a bit of a jog every day I mean heavy duty training for several hours a day. You cannot use this as an excuse to stop exercising. The books will tell you that Agnus castus is THE herb for regulating periods. This is because it works on the pituitary gland which is the gland responsible for sending messages to the ovaries to tell it what and how much hormone to produce during the cycle. You can buy it in any good health shop but make sure you follow the instructions. Of the plants we have seen on our herb walks, Yarrow has a tradition for balancing hormones and getting the cycle back on track and I use Tansy almost every time someone comes to me with irregular periods. Tansy is a strong herb so I do not recommend you trying it yourself. Once the periods are back on track, you can usually wean off the herbs within a couple of months, by which time the body will have been re-educated as to how it should work and will continue working in that way. If you would like to see me in my clinic, click here for more information or on the tab at the top of the page. You will see Horse radish growing wild all over the countryside. When we were visiting our son in Maidenhead, at Easter, we took the dogs, ours and two daughters, for a walk across the road in Braywick nature reserve and saw lots of clumps of Horse radish growing around and about. My Husband tells me it was his job as a boy to go and dig up the Horse radish root every Sunday, from the garden, to make the sauce for the Roast beef. I don’t think he can have had to do it that often as Horse radish root is gigantic and a little bit goes a long way. Of course you all know about the condiment, but it is not just a condiment! There is method in the things humans eat together and meat with Horse radish is an excellent combination because meat, being a high protein food is difficult to digest and Horse radish root is a digestive stimulant, increasing the output of digestive enzymes to improve the breakdown of foods in the gut. This is true of most herbs and sauces we put with meats such as sage and thyme and parsley. The other major benefit Horse radish has is to stimulate the circulation and therefore have a warming effect on the body. Steep for 5-10 minutes, strain, cool slightly, and sip slowly. It’s strong so one cup a day is enough. Or you can make a vinegar by putting 1 oz of fresh grated root into a pint of cider vinegar and leaving this to stand for about 3 weeks and then taking a teaspoon in water three times a day. This is really the home equivalent of a tincture which can be stored easily. NEVER take any medicine for any length of time. If symptoms persist then you will need help from a professional. Also I would like you to be aware that Horse radish is very strong so must be used in small amounts. It also has anti thyroid properties so that if you suffer from under active thyroid you should not use Horse radish at all. Actually this also applies to all plants from the “mustard” family, such as cabbage, radish and mustard itself. It sounds all doom and gloom but it isn’t. If you are not knowledgeable enough to use a particular plant then there is nothing stopping you looking at it on your walks and learning about its actions. I use this such a lot, but the smell still makes me shudder. It is a sea weed which is quite distinctive to look at being long and flat shiny and leathery to touch. Air vesicles in the plant look like nodules and sometimes it has little waves in it as if someone has taken curling tongs to it. Kelp was used as manure and in fact I saw a man collecting large bags of it on the beach today which I assumed he was going to use as a fertiliser. Kelp is high in iodine and other minerals, so is used to treat under active thyroid and boost the metabolism. I use it as a tincture in all mixtures to boost metabolism and just as a general tonic because it also has alterative properties (returning to normal). Normally I tell people to put their dose of tincture in a little water and swallow it down quickly, but because of the taste and smell I do allow people to put kelp into some apple juice if they really don’t like the taste. We stayed with my Uncle in Arundel over the weekend and went for a glorious walk on Sunday morning around the Arun valley. The autumn colours were spectacular, all red, gold, orange and yellow. There were quite a lot of plants still flowering, the nicest of which was the White Dead Nettle. It looks like a nettle but has a white flower a bit like an antirrhinum but it doesn’t sting if you touch it. The flowering tops of the plant are used medicinally which contain saponins and tannins. It is an astringent (toning) plant due to the tannin content, with anti inflammatory, healing, antispasmodic and menstrual regulating properties. It is used internally in tincture form for painful periods, cystitis, diarrhoea and irritable bowel. Externally it may be used as a douche (wash) for vaginal discharge. 2 oz of fresh herb is steeped in 2 pints of boiling water until the water is cool. This is then strained and the liquid used as a vaginal douche. If you have never used a douche before please do your research to find the correct way to use a douche so that you do not hurt yourself. The heading should say recurrent sore throats as everyone gets a sore throat now and again, usually associated with a cold, but recurrent sore throats indicate that the immune system is not fighting off invading bacteria and viruses. The Immune system is the body’s internal defence armoury, which protects us from the millions of germs out there. There are so many factors in modern day living which can affect our immune system, resulting in people picking up any virus going and suffering recurrent colds, coughs and sore throats. Stress, poor diet, Insomnia and any long term illness can all prevent the proper functioning of the immune system. We really must look after ourselves. Put a bit of time and effort into YOU and the payback will be a healthier, fitter, happier, more energetic life. There is also a possibility that a recurrent sore throat is being caused by intolerance to a food substance. Dairy is the biggest culprit in aggravating throats but just keep an eye on your diet and make a note if any foods do irritate your throat. Strangely, melons give me a sore throat. Cooked meal with some protein foods such as meat eggs or fish /pulses beans for the vegetarians or just if you like them. Fresh veg although fresh frozen will do if you are busy. Some carbohydrate such as rice potato or pasta. Always vary it though and make sure you do not eat too much of any one thing. Zinc and Vit C help the body fight of viruses. Echinacea is the Media’s herb of choice to boost the immune system which it does by raising the white blood cell count and increases the body’s own powers of resistance. It also has the ability to stimulate Killer cells called Phagocytes, that chomp up any foreign material in the body especially bacteria. Never forget Garlic. I know some people won’t touch it because of the smell but eat as much garlic as you can in your food. It is the most astounding food for all kinds of conditions in the body one of them being to boost the immune system as well as having antiviral properties. As it is breathed out through the lungs, the volatile oils sterilise everything on the way up so it is good for any condition of the respiratory tract. Specifically for the throat I use the old fashioned Balm of gilead. This is the herb that gave all those old cough remedies that distinctive “this smells horrible but I know it will do me good” smell. It has anti bacterial and antiviral properties and sticks to everything on the way down. As a gargle, Sage is wonderful. Put a teaspoon of dried sage in a teacup of boiling water. Leave this to stand for 5-10 minutes. Strain and cool. Use this as a gargle twice a day. My grandmother used to make us gargle with salt water for sore throats YUK it used to make me gag as I would always swallow some salt water and then feel sick. I loved her loads though, despite making me gargle with salt water and have enemas. She didn’t go as far as the leeches which would have scarred me for life. Please do come and see me in my clinic if you need more help. The clinic details can be seen here or if you click the “CLINIC” tab at the top of the page. There is so much written about joint problems that I am not going to pretend to know all the latest research, but tell you my experience of helping patients with painful joints and stiffness to achieve a better quality of life. Sadly by the time sufferers come to see me they have usually had the condition for many years resulting in degeneration (breakdown) of the joint lining. They have a long history of taking strong anti inflammatories, pain killers and possibly steroids. I know the joints are painful and inflamed but pain tells us when to stop doing something and if it is masked then there is a possibility the joint is used beyond its capability causing further damage to the joint itself. So my first advice is to always be aware of the limitations of a painful joint and only use it as much as is comfortable. Diet is very important but different people find their joints may react to different foods. The norm is to radically reduce the intake of dairy and wheat and never eat any Tomatoes and Oranges. The acid in these two foods is not broken down by the body so creates an acidic environment which is not good for joints and the urinary system. Many sufferers of joint pain find eating meat will increase inflammation. The message here is to keep an eye on your diet to see if any foods do make your pain and stiffness any worse. If they do, you may have to visit a nutritionist to cut out these food substances but maintain a healthy diet. Meadowsweet, a BIG favourite of mine, which has strongly anti inflammatory properties. A very ancient remedy for joint pain is to wrap the joint in cabbage leaves. This is not as barmy as it sounds as cabbage contains the active ingredient, mustard glycosides which are anti inflammatory! I had a patient who was a very keen long distance walker but suffered from joint pain and stiffness generally, which got worse after she had done a long walk. I treated her with herbal medicine but also advised her to wrap the joint in cabbage leaves during her walks. She reported to me that it reduced the pain and swelling after the walk dramatically and she was very happy! If you want to give this a go, get a knee bandage from a chemist and use it to keep the cabbage leaves in place. Don’t keep them there 24/7 as that may end up irritating the skin, but you could certainly keep it on for up to four hours. Of course, if you are allergic to cabbage or do get a rash when you put the leaves on then please remove them and wash the joint. There are many over the counter herbal remedies for joint aches and pain but if you buy one, make sure it is a licensed product, which means it is tried and tested. Very importantly, keep the joint moving with gentle non weight bearing exercise. Swimming is good as it exercises all areas of the body and an exercise bike is non weight bearing but muscle strengthening. Joints are supported by ligaments and muscles. Exercising keeps these in good condition, improving the overall strength of the joint. I do recommend if you have suffered from joint pain and stiffness for some time and are on orthodox medicines but want to try an alternative, that you visit a qualified Medical Herbalist who can take all those factors into account and will tailor make an Herbal Remedy specifically for you. Wow this puts on a spectacular display, about chest height (girly chest) downy large leaves with spikes of beautiful yellow flowers from about late June. It contains volatile oils (antibacterial), saponins and rutin. It is a soothing demulcent for the respiratory system. ‘Demulcent’ means an herb rich in mucilage that is soothing. When you feel the leaves of Mullein they feel wonderfully soft and silky which is a sure sign that the leaves contain mucilage. Mucilage, although it sounds disgusting, is great stuff as it coats and protects mucous membranes lining the gut and respiratory system. Mullein is used as a cough remedy for irritating dry coughs. See video on how to make Mullein Cough Syrup. As I explained on the video, how to make Mullein Cough Syrup, it is easy to make a cough syrup from it. Wash, dry and sterilise a jam jar. The best way to do this is to put the clean jam jar into a cold oven and turn the oven on to 200C and leave it in there for about 15 minutes until the oven is hot. Turn the oven off and leave the jar in there until it is cold. (Don’t try and take it out and burn your fingers and don’t pour cold liquid in there otherwise it will crack). 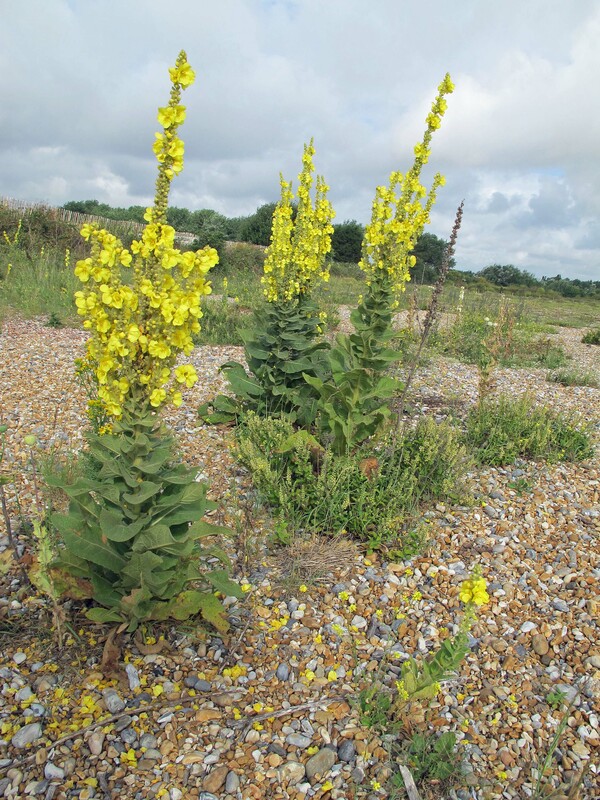 Pick as many mullein flowers as you can. Layer these in the COLD jam jar with granulated sugar, about 3 cms at a time. I hope you are proud of me being metric! Store it with the lid on, on a sunny window ledge. Topping up the jar, but pick fresh flowers every time. When the jar is full just leave it in sunlight for at least three weeks. At the end of this time you will have some very sorry looking flowers but a beautiful deep yellow/brown syrup. Strain the syrup through a piece of clean cloth into another clean jam jar and keep it somewhere dark (cupboard) and cool until you need it in the winter for a cough. I teaspoon three or four times a day will soothe the cough. Don’t forget if the cough is persistent, to go and see your doctor. If you are on any other medications or suffer from allergies please do not self medicate, but go and see a qualified herbal practitioner, click here for my clinic details or your doctor. This was our bonus plant we spotted on the Long Man walk. It was right at the end of the walk when the dog had run into the field adjacent to the path. The fumitory was growing in the unploughed edge of the field alongside other “weeds”. It is used as a gentle diuretic and has antispasmodic properties so is an excellent herb for cystitis as it washes the kidneys and bladder out at the same time as relaxing the muscle walls of the bladder which go into spasm if you have cystitis which causes people to have a feeling of being constantly desperate to wee even if they have just been to the toilet. Fumitory has other properties and the books say it is used as a spring tonic and as a cleanser for eczema. As I said I do not use it as I have other herbs such as red clover and heartsease which I prefer to use, but I do love to see it growing in the wild.